The popular chef's dedication and support to service members world wide cited as motive for the prominent bestowment. This recognition means so much to me because there is no group of individuals that I have more appreciation and respect for then the armed service men and women that protect and defend us every day. 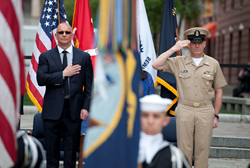 Robert Irvine has been recognized by the U.S. Navy as an Honorary Chief Petty Officer, a honor bestowed upon the celebrated chef on the basis of his dedication to the Armed Services and commitment to excellence. The recognition ceremony took place at the U.S. Navy Memorial Plaza in Washington D.C. on Friday, May 1, where Master Chief Petty Officer of the Navy (MCPON) Mike Stevens officiated the honorary title and plaque presentation to Irvine. “The Navy has been a part of my life since I was a very young man and still today holds a special place in my heart,” said Irvine. “This recognition means so much to me because there is no group of individuals that I have more appreciation and respect for then the armed service men and women that protect and defend us every day. This is something very special, and it's hard to find the words to express my feelings right now - ecstatic, humble, and excited to be in one of the best clubs in the world. You can't just buy into this club." "I often share with my Chiefs what it means to be a true leader, and I believe it means you are a quiet, humble, servant leader. By quiet, I mean we let our actions speaks for themselves, humble means we do not think less of ourselves, but think more of others, and to be a servant leader, means it is others we serve, not ourselves, “ said Stevens during the ceremony. “And Chef Irvine, it is evident you exemplify all of these qualities... I want you to know that your unbelievable dedication to our service men and women, and our wounded warriors is inspiring and has not gone unnoticed. It takes a special person with a big heart to commit the personal time and resources that you have committed in a most humble way." Irvine joined the British Royal Navy at the age of 15 and spent the next decade after that touring Europe aboard various naval ships. It was during this time that he began to explore and develop his culinary skills. Over the past 25 years, Irvine has become a successful, world-renowned chef, and always remained a great supporter of the Armed Services. He recently kicked off the United Services Organization's Entertainment Tour of 2015, traveling to Japan where he spent a week visiting, thanking and creating moments for our troops and their families stationed in the Pacific. Irvine recently founded a not-for-profit organization, The Robert Irvine Foundation, in an effort to strengthen his commitment to the men and women defending our country. The Foundation’s mission is to support individuals and organizations committed to enriching the lives of military personnel (active, retired and veterans) and their families. Visit ChefIrvine.com/foundation for more information. Additionally, Mr. Irvine has traveled the world with the USO and the Gary Sinise Foundation visiting with service members and their families while dishing up fine cuisine and providing cooking classes. With more than 25 years in the culinary profession, Chef Robert Irvine has cooked his way through Europe, the Far East, the Caribbean and the Americas, in hotels and on the high seas. As the host of one of the Food Network’s highest rated shows, Restaurant: Impossible, Irvine saves struggling restaurants across America by assessing and overhauling the restaurant’s weakest spots. Irvine was previously the host of Food Network’s Dinner: Impossible and Worst Cooks in America, has authored two cookbooks, Mission: Cook! and Impossible to Easy, and one healthy living book, Fit Fuel: A Chef’s Guide to Eating Well and Living Your Best Life. Irvine is currently on tour with his new, interactive live show Robert Irvine Live, and appears regularly as an expert guest on national morning and daytime talk shows. Irvine recently established the eponymously named non-profit organization, The Robert Irvine Foundation, in an effort to support military personnel and their families. For more information on Chef Robert Irvine, visit http://www.ChefIrvine.com.